Hyderabad, Apr 18 (UNI): Cyber-city Builders and Developers Pvt. 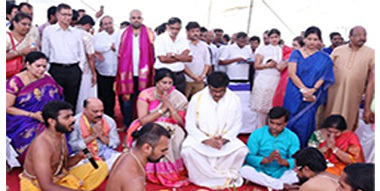 Ltd has laid a foundation stone for the construction of Marina Skies,the new project, here today.Marina Skies will redefine the concept of luxury living and worldclasstownship with its amazing features and that is strategic location. The project, conveniently located near HI-TECH City MMTS with the City’s IT hub on one side and prime residential zone on the other.Spread in an area of 22 acres with a built-up area of 5.89 million sft over different phases of the project, Marina Skies would be a combination of luxury and premium high rise apartments.Tridandi Sreemannarayana Ramanuja Chinna Jeeyar Swami performed puja for Shankusthapana ceremony and laid the foundation stone at the project site.The senior management and staff of Cyber-city Builders and Developers Pvt Ltd along with its customers and well-wishers participated in the Shankusthapana event. Mr Venu said with the company’s expertise and the commitment of its employees to their customers, the landscape of the city is destined to change. The company will be launching this project soon, the MD added.